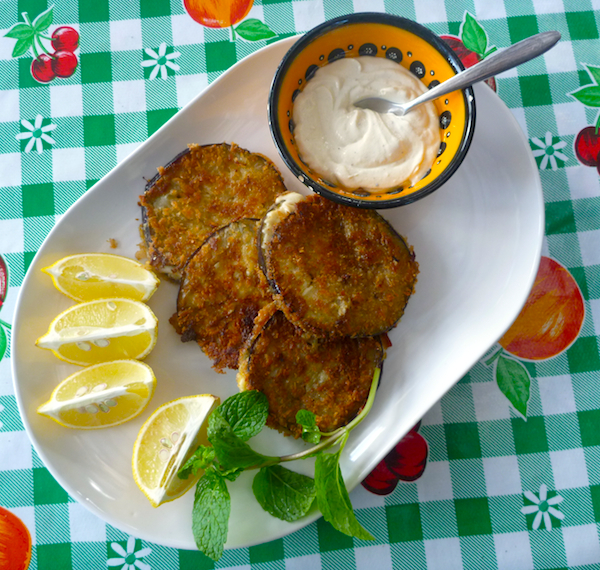 Years ago, whenever I had a dinner party, one of my standards was (depending on the season) crumbed eggplant slices or cauliflower florets, fried in olive oil and served with a garlic yoghurt sauce. They were always a hit because, seriously, who can resist anything that is both crumbed and fried. When you add some cheese and mint leaves in between, the eggplant slices it becomes practically irresistible. This is a vegetarian and middle-Eastern take on the traditional 1970s retro veal ‘cordon bleu’. Served with tahini sauce, it makes a lovely starter but my favourite way of eating this is in a kind of schnitzel sandwich, which transforms into a spectacularly satisfying, though slightly decadent lunch. These would have to be some of my favourite things crumbed – fried eggplant, haloumi cheese and the tahini sauce on good sourdough country bread make this one of my top ten sandwich combinations of all time. Cut eggplant into 12 thin slices, no thicker than ½ cm (¼ inch) thick. Place eggplant slices in a colander, sprinkle with salt. Let drain for 20 minutes, then rinse with water and pat dry well with kitchen paper. Lay out eggplant slices, top each one with a mint leaf then top half the eggplant slices with haloumi cheese. Sandwich eggplant slices together. Mix bread crumbs with za’atar (if using). Dip eggplants sandwiches into flour, then into egg, then breadcrumbs. Heat oil in large non-stick or cast iron frying pan and fry the eggplant sandwiches slowly until they are a deep golden brown. (Be careful not to fry them too quickly or the eggplant won’t cook and the haloumi won’t melt. Drain on kitchen paper and season with salt and pepper. Whisk all ingredients together until creamy and smooth. This sounds scrumptious~I love slightly decadent lunches!! Thanks for sharing! Oh boy, these sound incredible. I love the idea of putting them in a sandwich too. 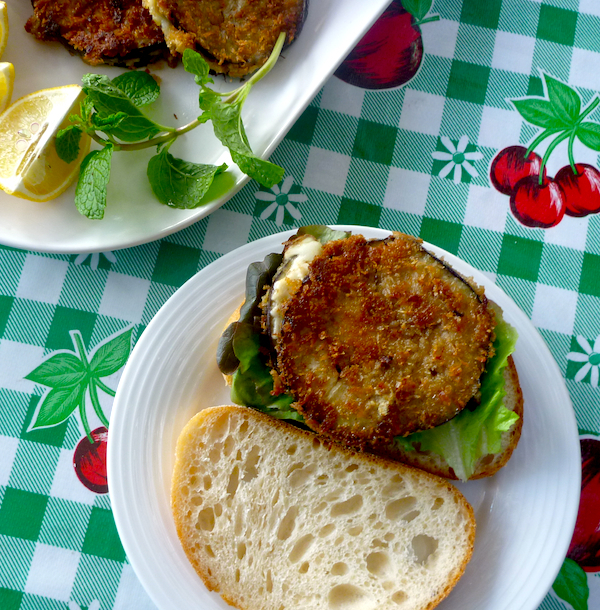 I shall have to try this for a decadent weekend lunch as soon as I get my hands on an eggplant! This looks amazing! I have been looking for something new & different to do with eggplant, and this is it. Thanks for sharing! I am with you, anything cooked in oil and crumbed is a winner. Looks like the perfect winter sanga. Please let me know how your vegan version turns out.